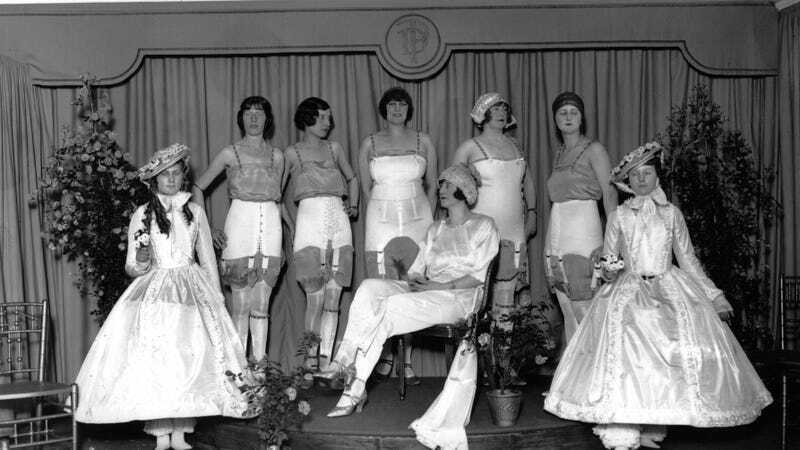 A group of models in a corset parade at Dorothy Perkins store on Oxford Street, London, 1925. Image via Getty. Take a closer look. She’s the one in the semi-Georgian getup. The question is why. Is our friend with the lips drawn at maximum pursed simply annoyed because she has to stand there in a girdle? Seems unlikely, because this photo was taken in May and the pair wearing all the layers are gleaming with sweat. Plus they have to hold those dumb posies. There must be some other underlying drama—unfortunately, it’s lost to history.